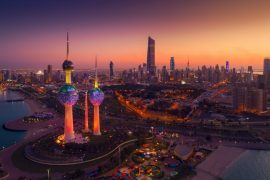 Top 10 Things to Do in Kuwait City. State of Kuwait. For a taste of daily life in Kuwait City you need to pay a visit to the Souq Mubarakiya which has been at the heart of the city’s commercial life for over 200 years. Visitors can wander around hundreds of stalls selling foodstuffs and can look for souvenirs to take home such as gold jewellery, perfumes, textiles and spices. Look out for the Sadu House which sells authentic Bedouin handicrafts. Local cafés around the souk are great places to stop for a strong Arabic coffee or a cup of traditional tea with a slice of date cake. There are also a number of restaurants where you can enjoy typical Middle-Eastern cuisine in the company of local shoppers and market workers. 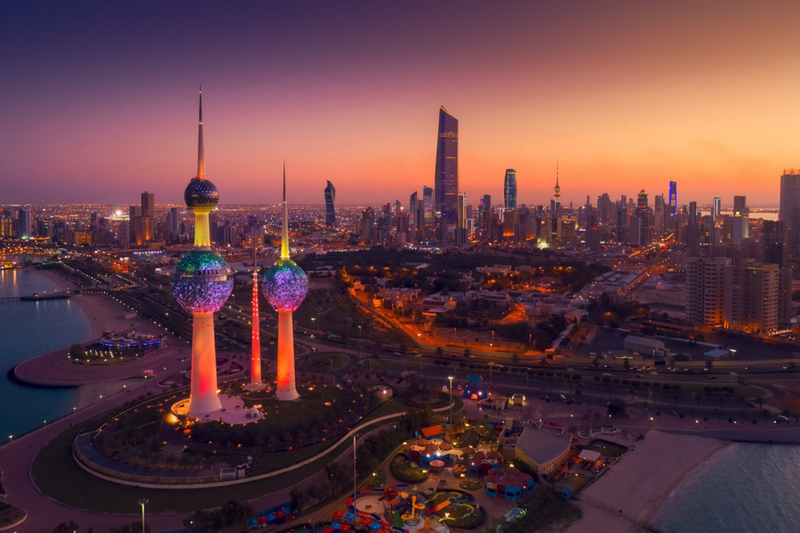 The iconic Kuwait Towers is the city’s most recognisable attraction which is home to the Horizon Restaurant which serves a popular buffet breakfast and lunch at its dining room which stands at a height of 82 metres above sea level. Guests are treated to a panoramic view of the city and gulf and are granted free access to the revolving observation deck further up the tower. Evening diners should arrive in time to see the sunset from the viewing deck before ordering from an international menu which includes many excellent lamb and seafood dishes. 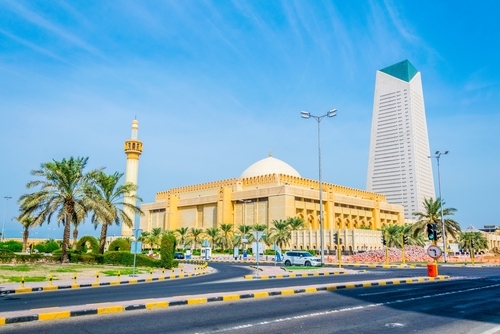 With a capacity for 10,000 men in the main prayer hall the Grand Mosque in Kuwait City is the 8th largest in the world. Women pray in a separate hall and there’s an outdoor courtyard which caters for another 7,000 worshippers. There are free morning and afternoon tours of the mosque in English except for on Fridays and Saturdays. The guides are really friendly and very informative with regard to the mosque itself and Islam in general. Female visitors are provided with abayas before entering. This enormous shopping mall is so big that visitors can pick up a 50-page directory listing all its shops, restaurants and entertainment facilities. With more than 800 shops this is the Middle East’s 2nd largest shopping mall after the Dubai Mall. It is divided into themed districts which are based on shopping places around the world such as the Champs-Élysées in Paris, Times Square in New York and Kowloon in Hong Kong. As well as serving as a shopping centre it is also an important social destination for Kuwaitis. Families can dine at the mall’s international restaurants, go to the cinema or take their children to the on-site theme parks such as Magic Planet. Anyone visiting Kuwait City should plan on booking a table at Al Boom and enjoying dinner in a restaurant which has been built inside the replica of an old Kuwaiti trading ship known as a ‘dhow’. Located within the grounds of the Radisson Blu Hotel this upmarket restaurant specialises in steak and seafood dishes. Prices are a little high even by Kuwaiti standards but the excellent food and attentive service make it a worthwhile experience. Traveller Tip: Whether you’re travelling to Kuwait for business or pleasure it’s well worth booking a private transfer from Kuwait International Airport to your hotel. On arrival your driver will be waiting for you and will safely deliver you to your chosen destination safe in the knowledge that you are travelling with a professional local transfer specialist. In 1966 Italian-Kuwaiti artist Lidia Al Qattan began decorating her home with mirror mosaics. Forty years and 70 tonnes of mirror later her project was completed. Visits to the Mirror House are by appointment only and are led by the artist herself who continues to live in the residential property. Lidia is a charming hostess who invites guests to tea and cake before leading them on a fascinating two-hour tour of her home. Urban parks are always a welcome escape for weary sightseers looking for some respite from the city’s museums and historic attractions. 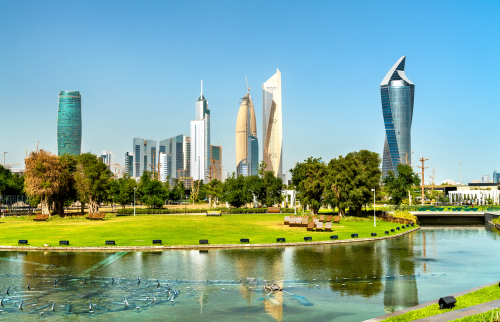 In Kuwait City it’s the beautifully landscaped Al Shaheed Park which provides this diversion. It is notable for its greenery and water features as well as being home to a botanical gardens and a few cafés and restaurants. It’s a popular spot for jogging during the day and attracts local families and visitors in the evening when the dancing fountains light and music show takes place. The city’s waterfront runs along Arabian Gulf Street for 10km from Kuwait Towers in the north to the Scientific Centre in the south. Overlooking Kuwait Bay this is the place where many Kuwaiti families take a leisurely evening stroll with a pit-stop at one of the cafés or restaurants along its route. Located on the seafront at the southern end of the Kuwait Corniche, this entertainment centre is an ideal destination for families with children. The aquarium with its shark tank is perhaps the highlight of a visit whilst the discovery centre offers a selection of educational activities for the kids. The site also hosts an IMAX cinema showing the latest releases from Hollywood together with a few cafés and restaurants. Approximately 20km east of the coastline of Kuwait City in the Arabian Gulf is Failaka Island which appears in the chronicles of ancient history as far back as 2000 BC when the Mesopotamians settled there. Most of its residents were forced to evacuate the island during the Gulf War. Today it remains largely unpopulated but has become a popular short excursion from the city. 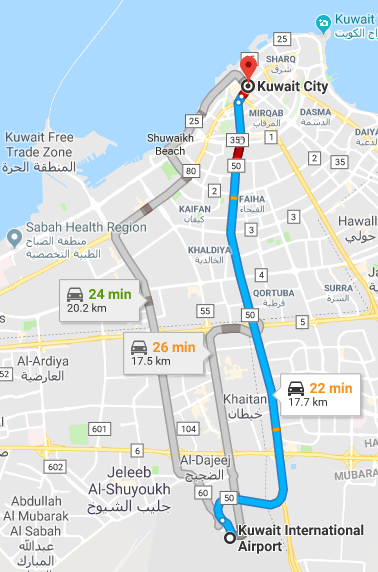 Private speedboats depart from Marina Crescent taking 30 minutes to make the crossing and there are regular ferry services from Ras al Ardh Marina near the Scientific Centre which take an hour to get there. Shuttle Direct is the most established and respected airport transfer provider in Europe and northern Africa. Our friendly local drivers will ensure your safe, economical, and convenient passage to and from the cruise terminal, airport, or major train station of your choice with a minimum of fuss. Book your transfer with our easy to use online booking system and leave the rest up to us! Gerry Kerkhof is currently living the life of the digital nomad as he follows in the footsteps of the Spanish Conquistadors in South America. He continues his work as a freelance travel writer and remains the voice behind the popular Spanish Fiestas website.